The recommended age for baptism within the Catholic Church is as an infant, and all parents are required to attend one Baptism Preparation session before the child is baptized. It is also highly recommended that the godparents for the child to be baptized to attend the preparation session. The first reception of the Sacrament of Eucharist is normally celebrated in the spring of a child's 2nd grade year. All 2nd grade children need to be enrolled in Religious Education and must have a baptism certificate on file with the Church office. All parents of children preparing to receive this sacrament are required to attend two Parent Preparation Sessions. The first reception of the Sacrament of Penance is normally celebrated in the fall of a child's 2nd grade year. All 2nd grade children need to be enrolled in Religious Education and must have a baptism certificate on file with the Church office. All parents of children preparing to receive this sacrament are required to attend two parent preparation sessions. The Sacrament of Penance is regularly celebrated at: 3:00-3:45 pm each Saturday and 7:15-7:45 am each Sunday. Confirmation I meets Sunday evenings from 5:30-7:00 pm. Confirmation I classes are for anyone 7th grade or older wanting to receive the Sacrament of Confirmation. You must satisfactorily complete Confirmation I before you may enter Confirmation II. This 2-year instructional program was created to better prepare our candidates for the Sacrament of Confirmation. In addition to the Sunday night classes, all candidates are asked to complete 9 service hours. Please contact the Confirmation I catechists for more information. Confirmation II classes meet Sunday evenings from 5:30-7:00 pm. You must satisfactorily complete Confirmation I before you may enter Confirmation II. This 2-year instruction program was created to better prepare our candidates for the Sacrament of Confirmation. In addition to the Sunday night classes, all candidates are asked to complete 20 service hours. All candidates are also asked to memorize several prayers and important facts about their Catholic faith. For more information, please contact Beth Mercer. Please call the Mother Teresa Church office at 785-286-2188, to schedule an appointment with the parish priest at least six months before any plans or decisions have been made. Please call the Mother Teresa Church office at 785-286-2188, to talk with the parish priest if you or a family member may be contemplating the call to a religious vowed life. Anointing of the Sick is done on the First Friday of each month at the 6:30 am Mass. 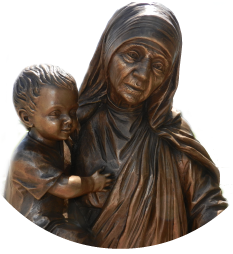 You may also call the Mother Teresa Church office at 785-286-2188, to talk with the parish priest if you or a family member may need the Anointing of the Sick.